Home / Uncategories / "Summer ends, and Autumn comes, and he who would have it otherwise would have high tide always and a full moon every night." Autumn is the time of the year that I come alive. I absolutely hate summer, so I begrudgingly wear shorts and a t-shirt, minimal makeup, and hope that I don't look like a complete hot mess by noon. But the cooler the temperatures get, the happier I become. Even though I'm up between 6:30 and 7 for my classes, I'm still taking a fair amount of time doing my makeup in the morning. I have so many fun fall colours to use, and I refuse to be a stereotypical slobbish university student. So for today's post, I thought I'd share some of the products I've been loving this fall! I'll start with face products. I'm embarrassingly devastated that the Dr. Jart Dis-a-pore BB cream is no longer on the Sephora Canada website, because it's my absolute favourite base. It has a very natural skin-like finish, and has good coverage for redness and unevenness, but never looks over done. It's the perfect light-weight base for early mornings. 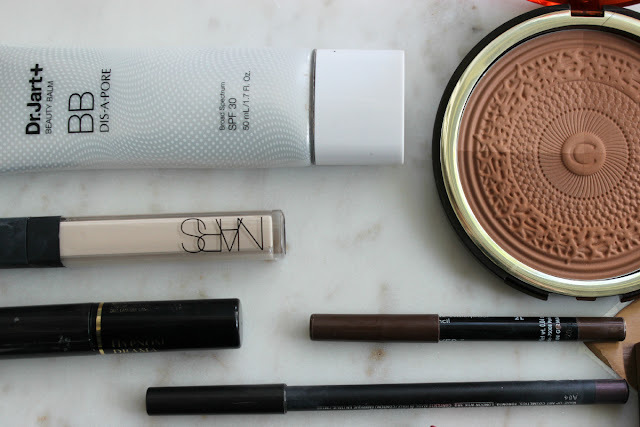 To fix my horrible dark circles, I'm still using and loving the Nars Radiant Creamy concealer. 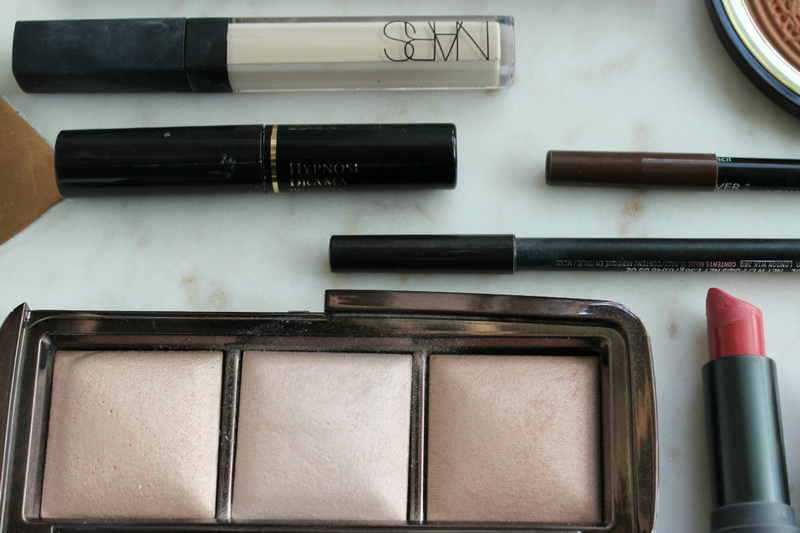 The Hourglass Ambient Lighting Palette has become a recent favourite. I like to set my under eye area with Dim Light, use Erethal Light as a highlighter, and use Radiant Light over top of my bronzer on those dull, cloudy fall days. As for my bronzer, I'm still obsessed with my Clarins Aquatic Treasures bronzer, which I swear I use on a near daily basis, but I've barely made a dent in. 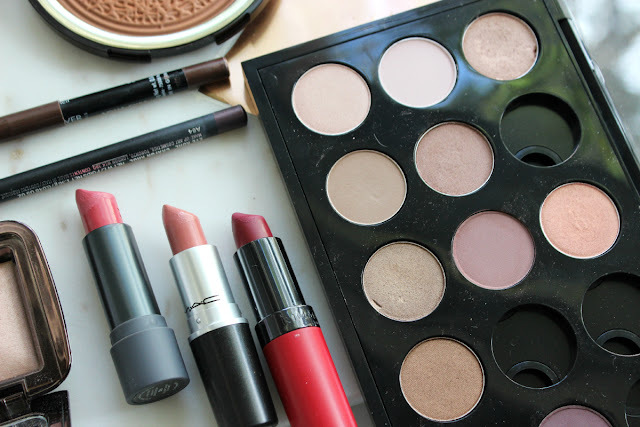 For eyes, I've been opting for my Mac palette that I've been slowly building up. I'll have a post soon with all of the colours in it. But right now, I've focus primarily on light-neutral shades that are subtle and appropriate for school. When I have a bit more time, I chuck on a bit of eyeliner in either Mac Prunella, or MUFE 2L. Lastly, I've predominately been wearing neutral colours. Bite Beauty Fig and Mac Patisserie (a Viviannadoesmakeup inspired purchase) have been my go-to's, but the Rimmel Kate Moss in 107 is still a staple in my beauty-wardrobe. What have you been wearing this fall?